Pennsylvania’s scenic state capital lies along the east side of the Susquehanna River, the largest, widest river on the East Coast. With the Appalachian Mountains a backdrop to the north, Harrisburg sits amid rolling farmland yet is a mere 2½-hour drive from major cities like Philadelphia, Pennsylvania; Baltimore, Maryland; and Washington, D.C. While the Capital Beltway spans the river with Interstate 81 to the north and Interstate 83 to the south, only two bridges link the city of Harrisburg to its western suburbs: the Harvey Taylor Bridge and the Market Street Bridge. Harrisburg International Airport sits to the south. The city is a relatively small one, easily navigated and a place that offers the joys of all four seasons. Au Bon Lieu on North 3rd Street whips up crepes both savory and sweet as well as coffee and tea. Breakfast, lunch or dinner, the choices are extensive and made with quality ingredients. Au Bon Lieu has an additional location in Hershey. The Jackson House on North 6th Street is a lunchtime-only favorite for locals. Half-pound custom burgers are the specialty along with cheese-steak creations, hand-cut fries, and every variation on a sandwich imaginable. The menu includes salads and grilled veggie options and is gentle on the wallet. Pastorante, also on North 3rd Street, has a staff of chefs devoted to the art of fresh-made pasta and Italian cuisine. Whether it’s real bruschetta you’re craving or authentic Italian wedding soup, fettuccine or tiramisu, you can visit for lunch or dinner. Home 231 on North Street scales up American eclectic with generous portions of farm-to-table selections. Lunchtime, dinnertime or brunch, the focus is on fresh, locally sourced ingredients, from the grilled corn and zucchini salad to the braised short ribs, carrot cake pancakes or homemade ice cream. Zeroday Brewing Company on Reily Street specializes in “clean, balanced ales and lagers,” also offering a selection of Pennsylvania wines and ciders. The tasting room is brewery-focused, but you can add a light snack like one of their enormous soft pretzels, a hummus combo or a Snack Pack. Millworks on Verbeke Street combines brew, food and art focused on local talent and sustainable food. Enjoy a meal in the full-service restaurant, some time on the rooftop biergarten or a tasty pairing in the open-air courtyard. Stroll the gallery, or tour the artist studios. Pair your favorite stout, dunkel or barleywine with a specialty from the wood-fired ovens, and feed your artsy side. Appalachian Brewing Co. on Cameron Street is a full-service brewpub with a menu ranging from small plates and appetizers to soups, salads, burgers and full entrees. Craft beers include both flagship and seasonal varieties as well as small-batch specialty brews and Appalachian’s craft sodas. Tours and tastings are available. Harrisburg is a family-friendly venue. In addition to its National Civil War Museum and Hersheypark, the city offers numerous entertainments indoors and out. National Civil War Museum—With Harrisburg just 45 minutes from historic Gettysburg and the Mason-Dixon Line, the city is host to a museum intent on portraying “the entire story of the American Civil War” and to do so “without bias to Union or Confederate causes.” The museum rotates its collections of more than 4,400 three-dimensional artifacts and 21,000 archival pieces. Exhibits feature items from recognized leaders of the day alongside artifacts embodying the average, everyday soldiers of both the North and the South. The African American Oral History Project highlights and preserves historical perspectives from the eras of slavery and Reconstruction through modern day. State Capitol Building—Modeled after St. Peter’s Basilica in Rome, Pennsylvania’s State Capitol Building ranks as “one of the handsomest” capitol buildings President Theodore Roosevelt “ever saw.” In spring, the capitol hosts countless school field trips. Tours are available daily. State Museum of Pennsylvania—You can discover Pennsylvania’s rich natural and man-made history dating from early Native American culture to current day. The museum also boasts a planetarium, with shows available Wednesday through Sunday. Whitaker Center for Science and the Arts—In addition to movies, theater and other events, the Whitaker Center is home to the three floors of the Harsco Science Center. Children can explore the sciences through KidsPlace, the Carnival of Health, Backstage Studio, MoveIt! and Forces of Nature. Pennsylvania National Fire Museum—For those obsessed with fire trucks and all things firefighting, the historic two-story Victorian-style fire house is a volunteer labor of love featuring antique fire apparatus, pumpers, carriages, engines, a 1935 ladder truck and vintage artifacts. City Island—In the middle of the Susquehanna River, City Island is best known as the home of FNB Field, baseball’s minor-league Senators, soccer’s Penn FC and football’s Central Penn Piranha. The 63-acre park also has City Island Railroad, a carousel, the Pride of the Susquehanna riverboat, carriage rides, batting cages, mini golf and assorted athletic spaces. Fishing—Harrisburg is known as Pennsylvania’s Fishing Capital. The Susquehanna River is more than a mile wide in some areas, with islands, boulders and rock ledges offering anglers opportunities for smallmouth bass, channel catfish, walleyes, muskellunge, rock bass and bluegills. Shallow water and rocks, however, make small craft and wading your best options. Wildwood Park—For a nature break and some fresh air, Wildwood Park is a perfect place to enjoy Pennsylvania’s natural beauty and wildlife. Hiking and biking trails let visitors enjoy the lake views and the birdwatcher’s boardwalk. Pennsylvania Farm Show Complex—The Pennsylvania Farm Show takes place the first or second week of January each year and lasts 10 days at the Pennsylvania Farm Show Complex. Over a century old, it takes pride in being the country’s largest indoor agricultural exposition, highlighting Pennsylvania’s primary industry—agriculture. The complex hosts numerous other events throughout the year. Hersheypark—Half an hour east of Harrisburg, Hershey’s amusement park is a prime destination. It is “one of the things to do in Harrisburg” for young and old alike. The complex houses The Boardwalk At Hersheypark and ZooAmerica, with tickets providing entry to both. The Boardwalk’s 70 features include 14 roller coasters, more than 20 kiddie rides and 16 water attractions while ZooAmerica allows an up-close view of North American wildlife. Visitors can purchase daily tickets as well as seasonal passes. Chocolate World is next to the amusement park. You can take a free tour, see exactly how Hershey makes its world-renowned chocolate, stock up on some decadent sweets and maybe even create a candy of your own. Indian Echo Caverns—For a natural underground attraction, Indian Echo Caverns is located between Harrisburg and Hershey, just off of Route 322. The limestone cave is over 440 million years old and remains at 52 degrees year-round. Pathways installed in the early 1930s still allow thousands of visitors each year to view the stalactites, stalagmites, and other fascinating mineral deposits and geological wonders. Professional Ice Hockey—Hockey fans can slip over to nearby Giant Center in Hershey to cheer on the Hershey Bears or support their visiting home team. With hockey season a long one, games start in September and go through April. Downtown. 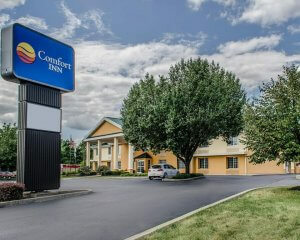 Both the Hilton and Crowne Plaza Harrisburg-Hershey are on Second Street while the Quality Inn is on Front Street. Airport. The area near Harrisburg International Airport has at least 20 different hotels situated along Interstate 83. 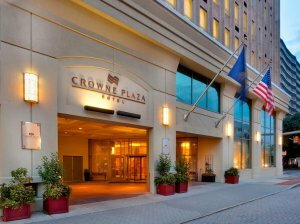 Choices range from Holiday Inn Express and Hampton Inn to Homewood Suites, Courtyard by Marriott, Sheraton, Candlewood Suites and others. North of the City, Interstate 81. Travelers interested in staying north of Harrisburg will find hotels spaced along the interstate as well as several located near the Harrisburg Area Community College. Options exist for every budget.